I ordered CUT AND CLEAR Powders last week. How to use it? Is it just gently applied on skin, cloth or the space I live? My purpose is to use it on myself and my partner. I was just one of his toys, not even his lover. I just want this to be a “goodbye gift” to him. Can I make him forget his ex-lovers with the help of this powder? Is this powder can only be personal or be also useful to others? I don't wish him to know it and I'm planning to spread this on his body secretly when I had the chance to meet him. What if he and his partner are still in love or in a unclear relationship, will this powder be still useful? Because I don’t exactly know the truth, he always tells lies. I think it's a little bit complicate. They are not in the same country. He told me this is the reason they are not able to be together. And he had several relationships after they got separated(maybe she don't know) but their communication on facebook is still like sweet. I'm not going to make him love me. I just want to let him forget his past. I admit that my intention is not pure. Will there be any retribution if I do it? I don't want to pay more for him, it's been too much. If it's possible to achieve the result by the help of the powder, what should I do? Because I don't have much chance to see him. Do I have to spread it on him more than once? And if there is any strange smell on his bed, he may wash his sheet and pillow. Re: How to use CUT AND CLEAR Powders? on others? Cut and Clear will not do what you're wanting it to do. It's formulated to help someone cut clear of the emotional baggage that is related to past relationships or other painful situations, so that they can heal and move on. You want something more akin to Break-Up - and generally those works take much more complex and ongoing work that just spreading some powder around once. Thank you of your advice. I just want to get go. By the way, if I feel better and stop to use the powder, how long should I wait before I can use another kind of oil? Do I need to be purified? 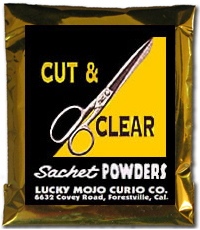 When using the Cut and Clear powder in the spell, I assume one should dispose of the used powder with the "bad" items, correct? Also, regarding the disposal crossroads, does it matter where it is located? Should you choose a crossroads that you do not travel often or ever? Will any urban intersection be suitable or should it be a more remote locale? Would it help to be near home or work of the targeted individual you wish to cut and clear from? That should answer most of your questions. And yes, it should be one that you don't pass over. One that you can just walk away and not turn back. By his house? That's a GREAT idea! If you have any questions after reading this link, don't hesitate to ask. Good luck with your spell. The cut and clear spells that I have seen people do have performed amazing results. This may be a silly question but is it imperative you dispose of the left over materials immediately following the ritual, same night? Or can it wait until next day? I like to dispose as soon as possible. But.. It can wait until the next day. BUT I wouldn't wait for a long period of time. 1) Can I use rose petals instead of jasmine? 2) Can I use the powder as an incense for this spell only or does it not burn well? Or should I use my Van Van incense as a substitution? 3) Since I am adapting this for myself, can I substitute Come to Me Oil with Attraction Oil or Crown of Success? 4) Since I do not have Cut & Clear oil, just the powder, can I substitute lemon juice to dress the candle, olive oil or Cast Off Evil Oil? I TRULY am sorry if this question isnt in the right place....I was wondering if it should go here or in the spell kit section. 1) As long as they are white. 2) Obviously you are unclear on what a sachet powder is. It is not an incense and burning it is not going to work. The question is just weird enough to make me shake my head. Would a woman burn her face powder as incense? 3) Well, kinda-sorta. Attraction if used for drawing new and unknown people (or money), but Come To Me is to call someone whose name you know. Give it a try, It is certainly not as out of bounds as trying to burn sachet powders. 4) Sure, but not the candle. Lemon juice is a watery liquid. Water and fire do not mic. You candle may sputter out of it is soaked in watery liquids. Better to oil the candle with olive oil and dust it with the powder. I wondered if you would be able to use the powder form to help someone else move on from a former lover? My current significant other has an ex wife who is clinging on for dear life and I don’t want Hotfoot or banish her. I wondered if I could lightly sprinkle some on our family Christmas card and pray over and mail it to her. Would it work in a similar way? I suppose my only concern would be that by touching and charging it, I would accidentally cut and clear my emotionally bonds with him? Short answer is no. Cut and clear is used on a person for themselves. Your partner would want to cut and clear and participate in the bath and the work. She would want to participate and do the work herself. Separation would end the relationship without fighting that you see with break up. The work effects the person it is made to effect, that is why a petition and prayer is so important. Cleanse after you do the work, traditional is hyssop and Psalms 51. This is something that you could try however cut and clear powder alone will be enough to achieve your desires. I agree with JayDee, this would likely not be effective. The powders are usually used in conjunction with a cut and clear spell and as he mentioned the target of the spell would at the very least need to be compliant so that one could perform the spell on their behalf. They would also need to take the bath. You would not have to worry about severing your emotional bonds with him however. Pour your intent into into the powders as you pray for your desired outcome. Again, this is something you could try. I'm all fir experimenting with certain things but more likely than not you are not going to be successful. That would take a lot more work. What you really want to so is separation. There are other non-viscious ways to do what you are trying to do. I posted one just the other day here:post393154.html?hilit=Spells%20to%20fin ... te#p393154. Skip down to section B, read it first and then read the entire ritual. You can adapt it so that all you are doing is getting her to leave him be. If she has trouble moving on from that relationship, you should consider a moving candle spell to get her to move on to another relationship. It creates a win/win outcome for everyone. They are very powerful when done correctly, and I have had great success performing them.